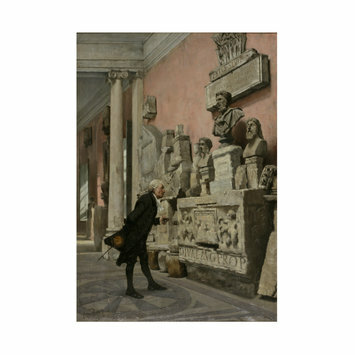 Oil painting depicting an archaeologist dressed in black, in the interior of the Musée Calvet, Avignon, examining a variety of marble and stone friezes and busts which are mounted on the wall. Historical significance: Henry Edward Detmold was born in London in 1854. He studied at Düsseldorf, Brussels, Munich and Paris (under Carolus Duran), and exhibited in London from 1879 and at Paris. He was a member of the Newlyn School, an English group of around 20 figural landscape painters based in the coastal town of Newlyn, Cornwall, many of whom, like Detmold, had studied on the Continent. 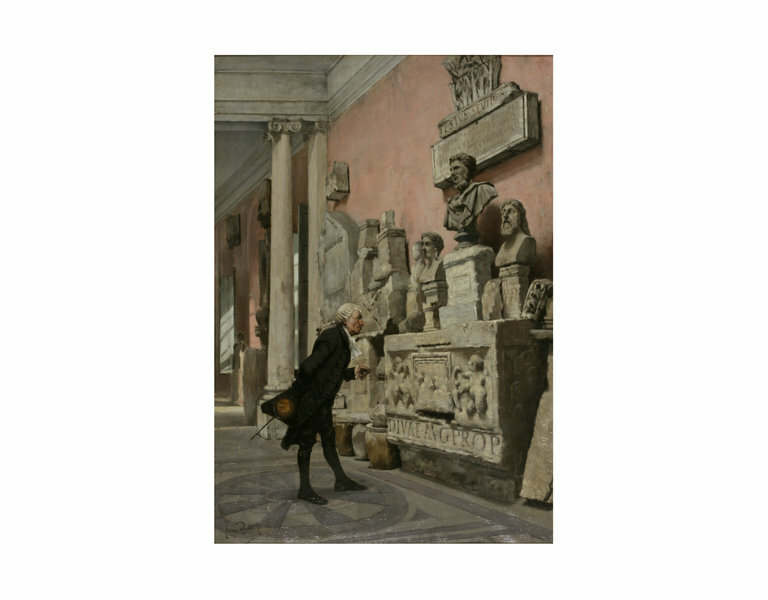 'The Archeologist' shows an interior of the Musée Calvet in Avignon with a man examining a display of ancient Roman sculpture. As the museum was founded in 1810, if the painting were to be regarded as topographical the man's 18th-century costume would be an anachronism. The painting was exhibited as no. 1279, priced at £31-10-0 in the 1884 Liverpool Autumn Exhibition. This painting was bequeathed to the V&A in 1916 by Henry L. Florence of Prince's Gate, South Kensington, London. The bequest also included paintings by Brangwyn, Clausen, Corot, Leighton and Fantin-Latour. 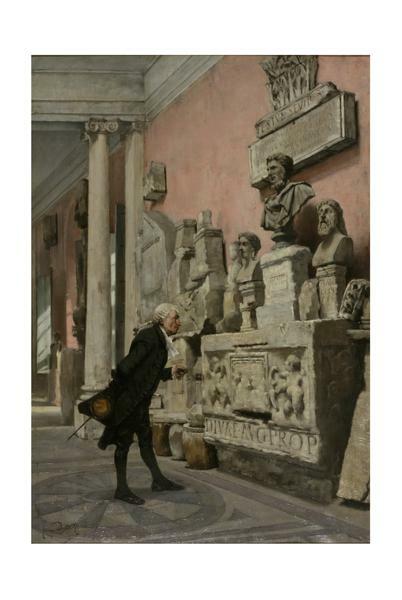 Oil painting entitled 'The Archaeologist: Interior of the Musée Calvet, Avignon, with a Man Examining Sculpture' by Henry Edward Detmold. British School, ca. 1880-1917.